Voter support for wind energy is at an all-time high. Sometimes the more you know about something, the more you like it. And that’s the case for wind energy. The amount of installed wind capacity across the U.S. has tripled over the last eight years, and people are taking notice. Recent polls show U.S. voters like what they see in wind energy. And that’s especially true for those where wind energy has grown the most. A batch of polls from the last several months find strong bipartisan support among likely voters, and that support strengthens even further in wind-rich areas. Nationally, 70 percent of registered voters have a favorable impression of wind energy, according to a mixed question omnibus poll of over 1,000 respondents conducted by the survey research firm SSRS. That includes over 60 percent of Republicans and Independents. But wait, it gets better. When you survey those who know wind power best, it’s as popular as mom and apple pie. Another poll surveying likely voters in Iowa’s Third District, recently conducted by WPA Opinion Research for the advocacy group American Wind Action, found 91 percent support wind energy. Iowa’s Third District is one of the top 20 in the country for installed wind power, and if anyone knows a thing or two about wind energy, it’s the Hawkeye State. Iowa has more wind energy per land area than any state in the country. It leads the U.S. by generating over a third of its electricity using wind, and it’s home to the tallest operating wind turbine in the nation. A similar story has played out in Texas. Texas ranks first in the nation for installed wind capacity, and wind supports 24,000 jobs in the Lone Star state. A recent poll there by the nonpartisan Texas Clean Energy Coalition found 85 percent of registered Texas voters support increasing clean energy like wind power, including 78 percent of Republicans. At the end of 2008, there was just 25,065 MW of wind power deployed across the country. 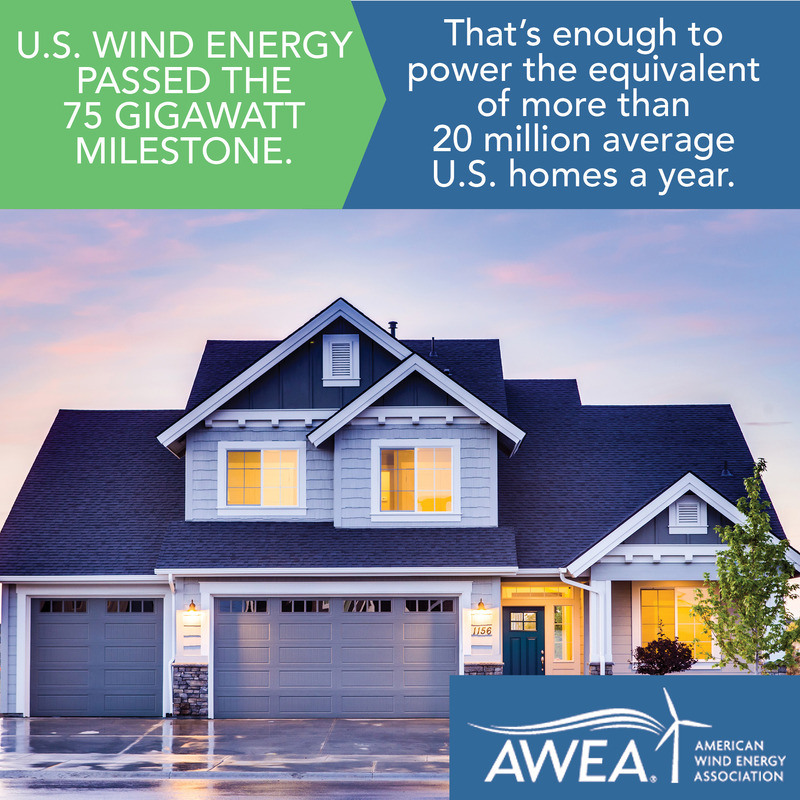 In less than a decade that number has tripled to 75,221 MW, enough to power 20 million typical American homes. These wind turbines produce as much electricity as 17 typical nuclear plants or 65 coal plants. For a different perspective, they generated as much electricity as is consumed in the states of Iowa, Kansas, Oklahoma, Nebraska, North Dakota, and South Dakota…combined! Innovations in wind turbine technology and site selection have helped cut the cost of wind energy by two-thirds in just six years. Modern wind farms with taller towers and longer blades generate more electricity more efficiently than ever before. Simultaneously, wind turbine manufacturers continue to drive wind turbine prices downward, despite the increase in overall size and sophistication. In many parts, of the country, wind is now the cheapest source of electricity, and it’s cost-competitive in many more. Wind’s strong growth is expected to continue in the coming years, as we’re on track to quadruple by 2030 when we can supply 20 percent of the country’s electricity. Staying on track to that goal will give even more Americans the chance to learn about, and love, wind power.